Those born between February 3, 1973 and January 22, 1974 are members of the Water Ox Chinese Zodiac sign. The OX is quiet, steadfast, methodical and can tolerate difficulties. Ox people are hard working and down to earth. They are exceptionally clever and creative with their hands. In business, the ox often brings prosperity, not through entrepreneurial imagination and risk, but as a result of logical thought, resolute practicality, and honest endurance. Ox people should seek their fortune as a surgeon, dentist, architect, tailor, or technician. 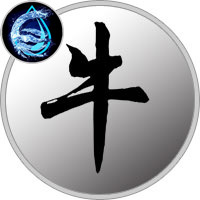 The fluid influence of the Water Element does well to curb some of the stubborn and close minded qualities that usually dominate those born under the Ox sign. The Water Ox is the most patient and the most effective communicator of all the Ox signs. The Water Ox has the special gift of a quick mind, which it can use to bring innovation and flexibility to all aspects of life. These qualities allow the Water Ox to work on multiple goals simultaneously to achieve a greater level of success. Socially, the Water Ox can be quite sensitive and has a real interest in the well being of others. As an understanding, adaptable communicator, the Water Ox can be successful in a variety of careers. The Water Ox can use their gifts for communication in business or sales. On the other hand, seeing as they do not need the same level of rigid structure as other Ox signs, the Water Ox may have the chance to follow unique career possibilities. For example, Water Oxen, such as Dave Chappelle and Kristen Wiig have been known to draw audiences with their clever whit and relatable comedy. Unlike others born under the Ox sign, the Water Ox may be too willing to forgo ideals in order to achieve higher status. Water Oxen are encouraged to try and mitigate any moral downfalls by staying true to their moral compass. Water Oxen are much more flexible, and because of this quality, they’re better able to understand what others are thinking and feeling. They’re sincere, patient, quick-thinking and others enjoy being around them.